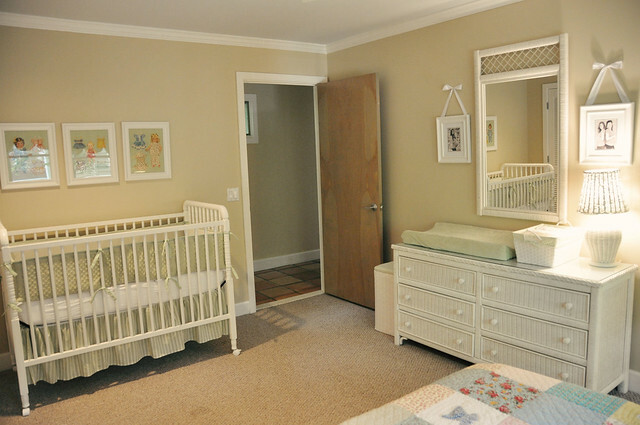 We cut it close with the nursery. I'm "right on the cusp" of having this baby according to my doctor at my appointment on Tuesday. I can't believe how much I've progressed already, and we're ready for her to come at any moment! This momma has been in serious nesting mode, and this poor daddy is probably about to lose his mind. Bless his precious heart. 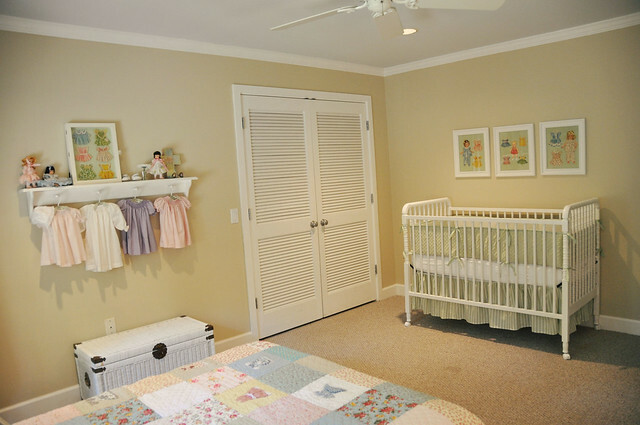 Now that you've seen the nursery from all four corners of the room I want to talk about where I got the inspiration for it. I knew that we were going to keep this room a guest room, so the first thing I did was start searching for the perfect bedding. 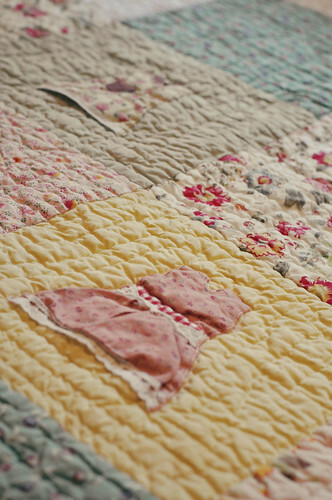 When I found this doll dress quilt from The Land of Nod I immediately fell in love. This was it! And the ideas began to flow. It was kind of like what happened when I found the matryoshka doll fabric for Lael's nursery. 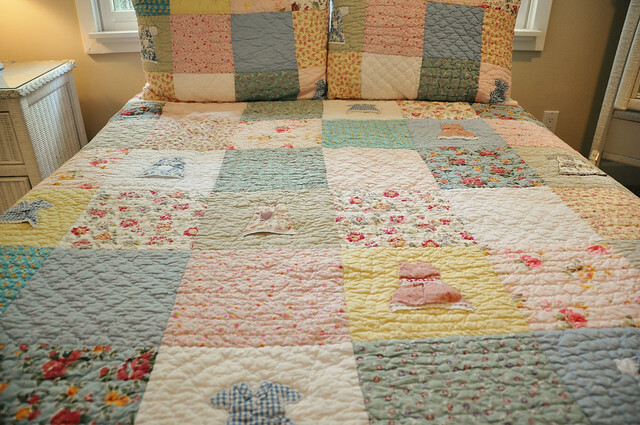 I love this bedding because it's not too loud, it has an antique/vintage feeling to it, and it's oh so sweet for a little girl's room. 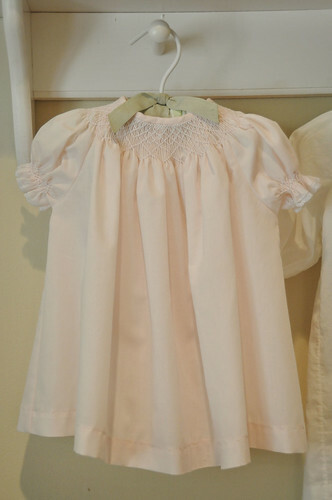 Check out the precious little doll dresses sewn onto the patches. Let me tell you something about vintage. I'm a sucker for it. So, when I decided that it was kind of the route I was going, it dawned on me to incorporate paper dolls and their dresses to coordinate with the bedding. I LOVED paper dolls when I was little. 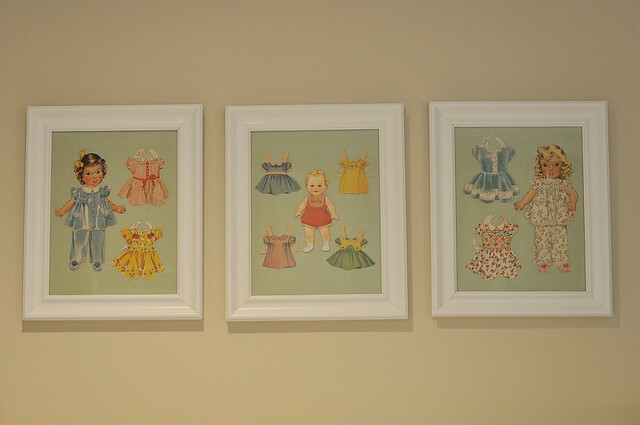 I found these vintage paper dolls on ebay, and they're from the 1920's. I about had a fit when I got them in the mail. Trey probably thought I was about to tell him that my water broke when he got home that day and I announced that I had received them. I got these white frames, used green and white gingham fabric for the backgrounds, and glued on the dolls and their dresses. I went very simple with the crib bedding. I'm not a very pinky person--ironic since I'm the mother of two girls, but it's just never been one of my favorite decorating colors. I wanted to choose one of the colors to pull from the bedding, and didn't want to do pink or blue so I chose the green. I love using green in my house and it went well with the paint that was already on the walls in this room. The crib. 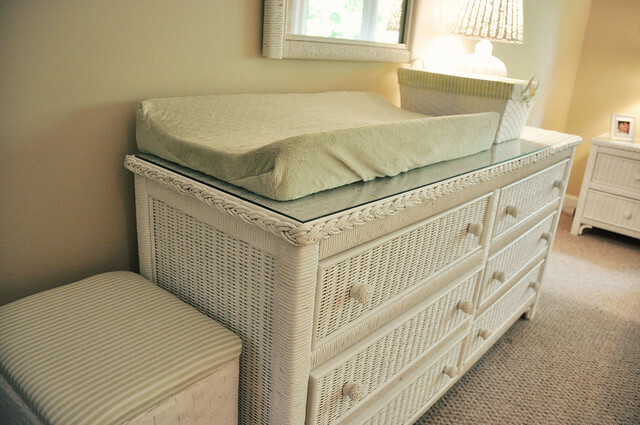 Oh, the crib. 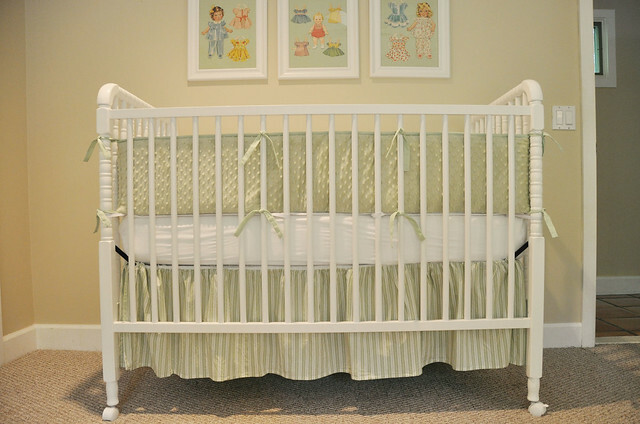 Would you believe me if I told you that I bought this brand new Jenny Lind crib for SIXTY DOLLARS at Wal-Mart?? I almost kissed the cashier. Had no idea that it was going to be 50% off when I went to check out. Nothing wrong with it, they're just discontinuing the model. Jackpot. I bought a bare wood shelf and Trey spray painted it white. 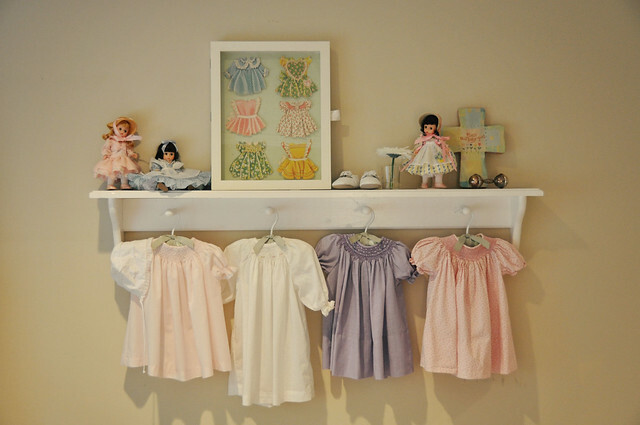 Once again, I ran with the doll dress theme and used some of the smocked dresses I have as part of the decor. The two dresses on the left are ones that I made (far left, Ruthie's coming home dress, and next to it was Lael's coming home dress.) The two dresses on the right were made by my mom and were worn by me, my sister, our cousins, and Lael. The white bonnet was mine and she'll wear it with her dress coming home from the hospital. You can see pictures of Lael with it on here. 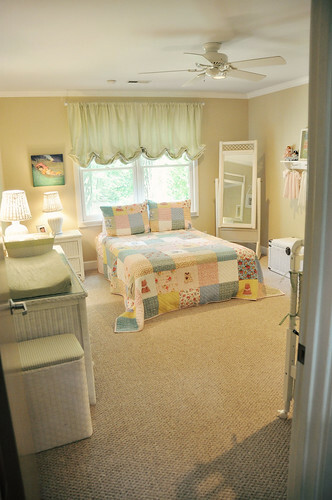 The white wicker furniture in this room was passed down to me from my Memama when she downsized. That was back in college, so my sister and I both used some of the pieces in our apartments during school. This stuff has been moved around a LOT. I can't tell you what a blessing it is to have it and be able to use it for my daughter's room. I always kind of assumed that this is what I would do with it, but I just can't believe that this day is actually here. 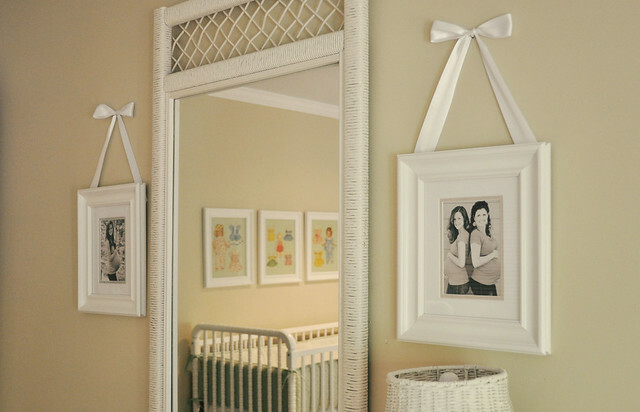 When I get pictures of Ruthie I will put them in these frames, but for now I wanted to put a couple of belly shots in them. Being pregnant with Jess is one of my favorite memories of this pregnancy, so naturally I had to use one of those pictures to fill a frame. 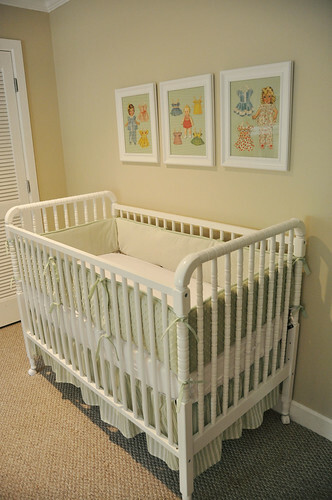 We have two cribs in our house. While Trey and I were finishing the final touches we both agreed that we're so glad we made this room for Ruthie. 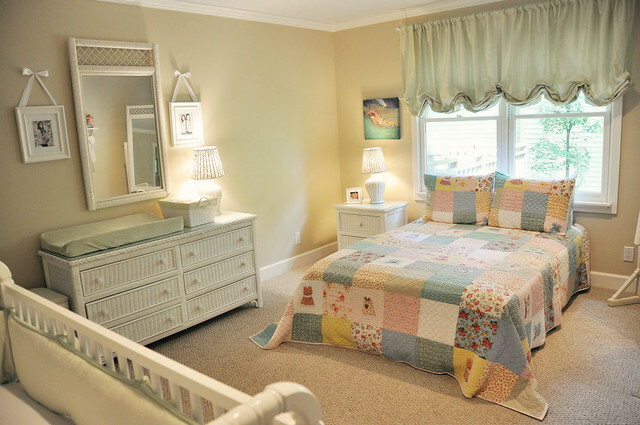 Originally we thought we would give Ruthie Lael's room and move Lael in here, but then changed our minds for multiple reasons. 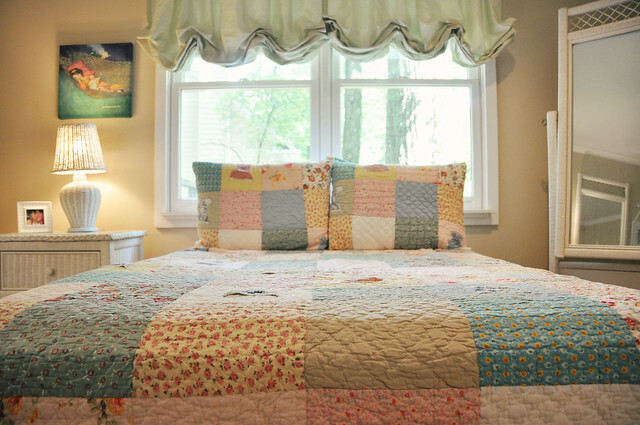 It brought me so much joy as Ruthie's mother to create a room just with her in mind. I have dreamt of being a mother for as long as I can remember, so it goes without saying that preparing a room for one of my babies has been a labor of love and precious time spent. I can hardly wait to show it to her. This room is gorgeous. I love all of the colors. I just came across your blog. It's so sweet. Congratulations on your pregnancy! 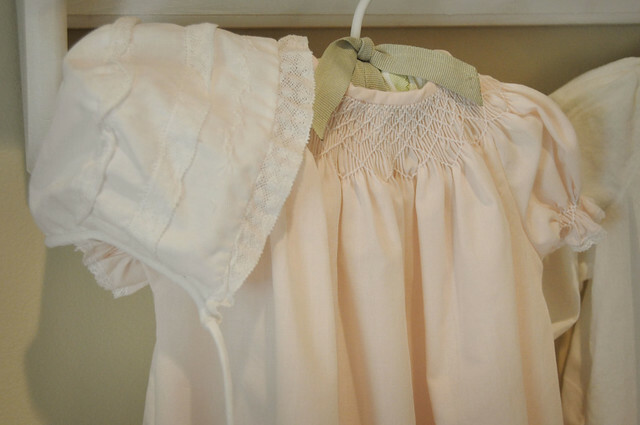 Your great grandmother, Octavia Dunn, used to sew doll clothes and give them to your mom and me for our dollies. 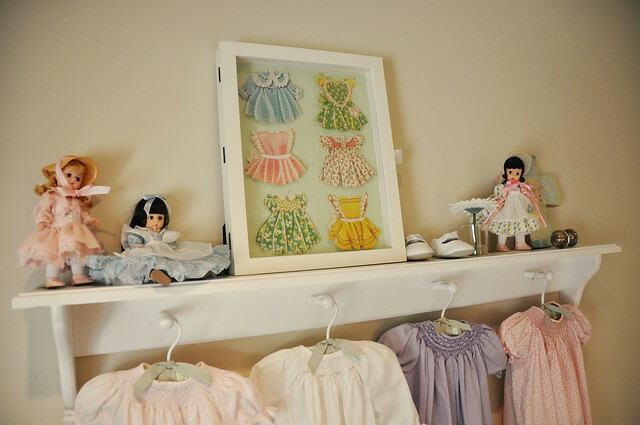 I thought of her in the framed paper dolls and quilted doll dresses. You've made her proud! I love it!!!! I love how it has all come together. You did a great job- It's beautiful!!! Now we just need the little doodlebop and it'll be complete! :) I'm honored to have made the wall- that will forever be one of my favorite photos- what a special day it was.. 28 and 28!! (If we were still adding to our handshake, that would Definitely make the cut! :) ) What a precious gift from the LORD! what a beautiful nursery...you are really talented! Beautiful! What a peaceful place! 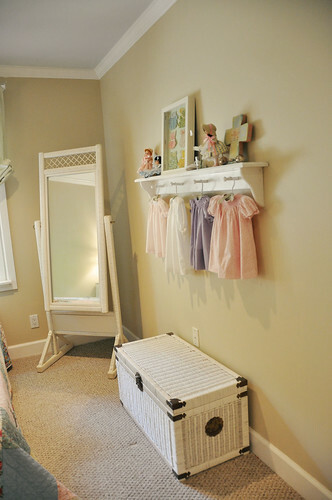 I especially love the frames with the dolls and dresses you glued in! Adorable and vintage-y!